California's farm sales are about $31 billion a year, with three-fourths from the sale of crops and a quarter from the sale of livestock and poultry products. 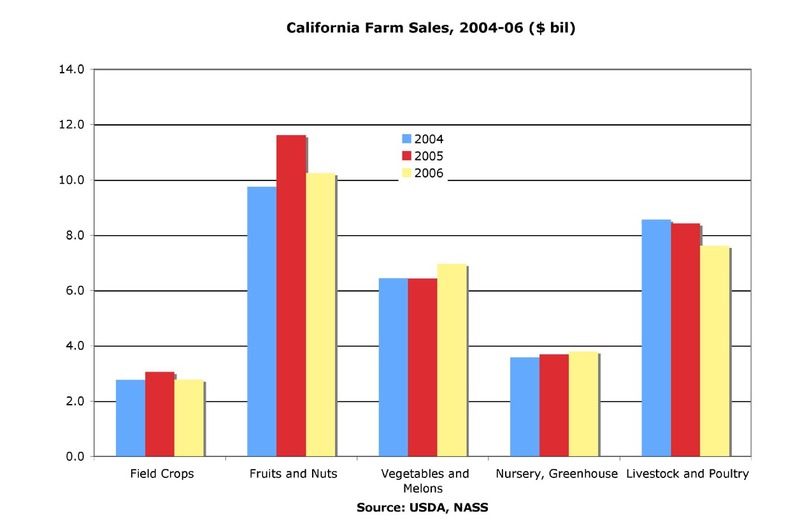 Fruit and nut, vegetable and melon, and nursery and greenhouse commodities account for about two-thirds of California's farm sales. The value of the state's so-called FVH commodities, about $21 billion, equals the value the farm sales of the second and third leading farm states, Texas and Iowa. US FVH production has also been increasing. The production of noncitrus fruits rose from about 17 million tons in 2001-02 to almost 19 million tons in 2006, while the production of fresh vegetables was stable at about 465 million hundredweights since 2001-02. Citrus production fell in 2005-06 due to hurricane damage in Florida and freezes in California.